I consider myself very lucky when I am reading a book that I wish would never end. 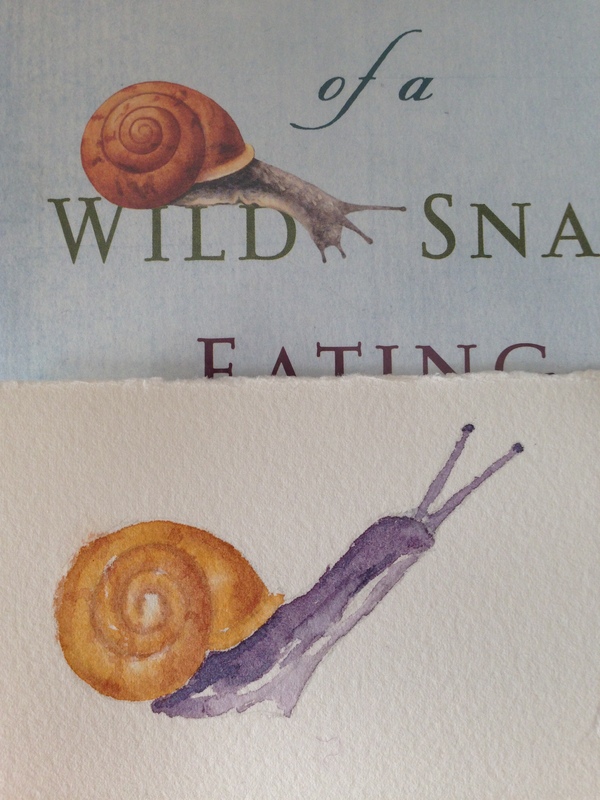 This is such a book: “The Sound of a Wild Snail Eating” by Elisabeth Tova Bailey. The illustrations throughout are wonderful. I hope you find a chance to read it, as well. Here is a link to the book on Goodreads, where you can find more information about it, if you’re interested. It is a true story about a young woman in her mid-30s who became chronically ill, and was bedridden (and could hardly move) for some time. While walking in the woods, her friend found a snail and some violets, planted them in a pot and brought the whole bundle to her friend’s bedside. This is their story. I have to say, it was a real pleasure to try and re-create this author’s companion and friend. I put it on my wish list, but I do have so many books already I have not read. 🙂 And it is GFC (Girlfriend Camp) at the beach, so who knows how much actual reading time I will get LOL! No doubt, you Wild Child! I may may be as much of an introvert as you are an extrovert, but I get the biggest kick out of all of your adventures. The world is a big quilt, and it takes every color and texture to make it all work. 💜 Keep shining your light, wild woman! makes the world go round – eh?! 🙂 I guess you could say I’m a teensy bit of an extrovert LOL! Lol you remind me of my sister. She is always on the go with about a million different people. It makes her so happy! I say, whatever works, and it definitely works for you! 💜 Don’t get me wrong, I love people too, just in small doses lol!! Hmmm…I might have to check out this book too. 🙂 I just finished reading “The Unlikely Pilgrimage of Harold Fry” and thought you might like it. And btw….that snail is a cutie. Kathy, I LOVED Harold Fry!! Oh, that was an amazing book!! I’m glad you enjoyed the little snail. I do predict you would love this book! Thanks for the book review as well as the art; when I went to the link I found that one of my favorite “friend” reviewers had a similar reaction to yours, so I’ll have to add it to my (also neverending) book list too. I love the way you rendered the shell, and as usual good color choice. Thanks! It was fun. I think the shell needs more darks. Not sure if it’s worth putting more time into at this point, but I think I’d like to do more snails. Shells are so fascinating! I like the pink puddle best, I think. It’s fun to play with color. He’s adorable! Looking forward to seeing what you do with the snail in the future. I too find shells fascinating and each unique. Thanks, I’m glad you liked him! 😀 I’d like to paint shells also. LOL! The last one I tried bombed. I’ve been drawing them at night. But mostly, I draw hands and feet (or Hub’s) in my art journal. I’m hoping for a seascape today. I may throw a shell in! We’ll see what happens! By the time I sit down to paint, I may wanna do something totally different. And then the Watercolor Gods may or may not visit. hehe. The book is really good. I should wait until I’m finished, but enough people I trust have said it was good, that I felt like spreading the word. I’m glad you think so Jill. :))) we’ll see. I may be biting off more than I can chew. Oh well, wouldn’t be the first time lol. Awww, this is so cute!!! I really like snails. I used to watch them sometimes in our garden in Hungary and found out that they are not that slow at all. 😊 Heard of the book, glad you reminded me of it. But back to your picture: I really like your use of colors here, it´s really beautiful!!! Thanks, Ann. I’m glad you like snails! :)) What’s missing in this painting though. Do you think it needs more darks? What would you do to improve it? I do hope you enjoy the book! If you like snails already, I don’t see how you can go wrong. Thanks for the information about this book. I added it to my must read list. Laura, thanks for the invite. 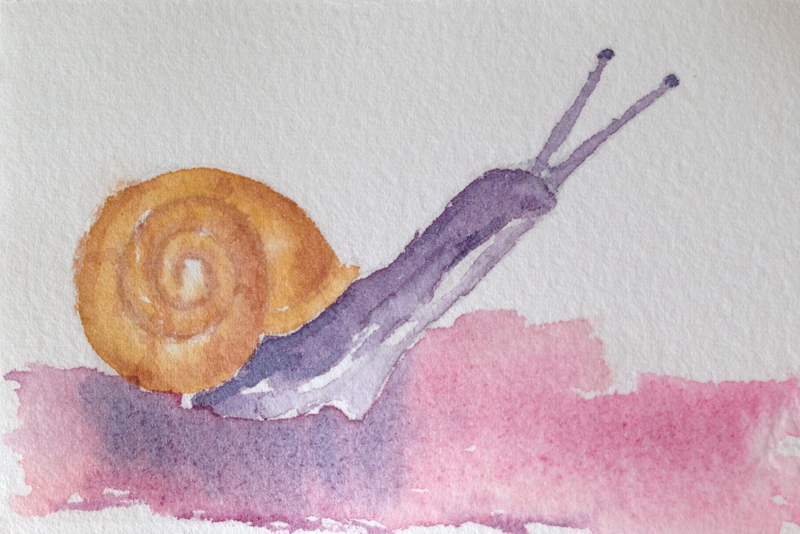 Lovely snail Laura – nice touches and control over the watercolor. Thanks, Mary. I enjoyed that one. I’m really enjoying daily painting. Do you work on something every day too? I really try too, I would say probably 4 or 5 days a week if even for 1/2 hour. It’s been a good discipline for me – keeping it all fresh. That’s really good to hear. Time doesn’t always allow, but to keep a regular, “more often than not” practice seems to be a worthwhile investment. Absolutely, the learning curve moves right up the ladder. Usually do the blog and pmp site for 1 hour daily, then 1 hour of reading an art book or watching an art video, and then anywhere from 1/2 hour to 3 hours (sometimes 4) of painting and/or drawing. Now that my husband has retired we are trying to find a happy medium of fitting in my art schedule. Wow, that sounds wonderful, Mary. It clearly works for you! Have you been painting all your life, or did you pick this up midstream? Thanks Laura, I started drawing February of 2011 and painting in June of 2011 – and haven’t looked back. Love it to the point that it consumes me at times, without regard to time or environment. Wow! I understand you completely! I started last August. I’m a bit obsessed. It’s completely fascinating, challenging, and rewarding. I’m totally hooked. Boy, you’re an inspiration if you only started a few years ago. Your work, to me, looks very practiced. Added that to my goodbooks list. thanks! cute snail.